On a breezy morning in November, a handsome 1920s-style yacht came to a brief stop in the choppy waters off Lower Manhattan — the perfect opportunity for our group of 15 or so passengers to jump up from our comfortable seats and crisscross the glassed-in cabin, cellphone cameras poised. In every direction, an icon loomed. Just to the south was the Statue of Liberty, not some tiny figure in the distance, but 225 tons of copper, steel and iron outlined against the cloudless sky. Closer in, Ellis Island basked in the sun, its main building a Beaux-Arts-style wonder of arches and towers and cupolas — “a symbol of the public grandeur that awaited immigrants,” as the architecture critic Paul Goldberger once put it. Such observations — and he offered several — made it easy to think of the city as a palimpsest, a place where the old makes way for the new, but never really gives up the ghost. We had already sailed past a few examples: industrial buildings transformed into apartments and offices in West Chelsea; a derelict freight line reimagined as the High Line. And now, standing before us was One World Trade Center — at 1,776 feet the tallest building in the Western Hemisphere. Not only was it an homage to what stood there before Sept. 11, 2001, but it was also an indirect reference to a building the Trade Center towers above, the nearby 40 Wall Street, an Art Deco beauty that was itself built to break records as the tallest building in the world some 85 years ago. 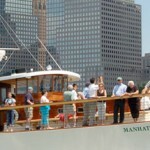 Indeed, our 80-foot-long vessel, the Manhattan, did possess a certain nostalgic elegance. If you have an hour and a half and $46 to spare, you, too, can sit back in the climate-controlled cabin, with its teak floors and Oriental-style carpets, and sip a free glass of wine or Champagne as the urban landscape slips by. Passengers can also venture onto the deck, not an appealing option on that chilly fall day. Our group of tourists and New Yorkers opted to stay inside, listening to Mr. Kriskiewicz as we sailed from Chelsea Piers up to the Intrepid Sea, Air & Space Museum, then back down the Hudson River, around the southern tip of Manhattan, and into the bustling East River, with its ferries and sailboats and helicopters buzzing overhead, before turning back the way we came. Along the way, Mr. Kriskiewicz pointed out various enigmas and oddities: The purpose of those towers above the Holland Tunnel? To house the fans that ventilate carbon monoxide so drivers don’t choke when they drive beneath the Hudson. At 200 11th Avenue in West Chelsea, designed by Annabelle Selldorf’s architectural firm, “you can drive into an elevator and park in your private sky garage.” At South Street Seaport, the tall-masted ships docked there reminded Mr. Kriskiewicz that the word “skyscraper” was once used to describe the masts. It wasn’t until the late 19th century, said Mr. Kriskiewicz, that the term as applied to buildings appeared in print. Making our way back around Lower Manhattan, we again took in the crowd of multigenerational buildings that seemed to jostle right up to the edge of Battery Park, as if vying to get the best view of us. It was an oddly intimate encounter with the ever-evolving metropolis — the kind of encounter best experienced from the water, preferably with the insights of someone like Mr. Kriskiewicz ringing in your ear. Departing from Pier 62 at Chelsea Piers (West 22nd Street and the Hudson River), the 90-minute Lower Manhattan Architecture tour, offered by the New York Chapter of the American Institute of Architects and Classic Harbor Line, is available from April to mid-November. Tickets, $46 for adults, $32 for students. For information on this and other architecture- and infrastructure-themed cruises, visit Classic Harbor Line, sail-nyc.com.